Oroklini (or Oraclini or Voroklini) is well known for keeping local traditions and a serene, tranquil family life. 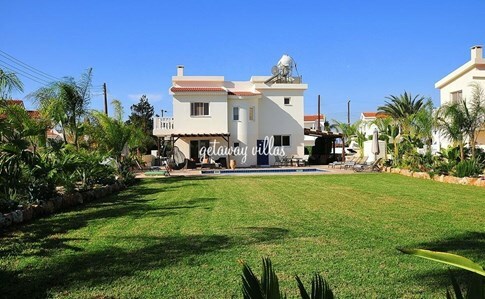 Situated 8km north easterly of Larnaca town centre, 1 km from all main traffic routes. Oroklini Village provides all amenities and is ideal for both holiday seekers and residential dwellers. It has a population of about 3000 residents and is proving a very popular destination for family holidays. Oroclini village offers a wide range of shops including: supermarket, butchers, bakery, bank, chemist, laundry & dry cleaners. Over the last few years the village has continued to grow with new private homes and the renovation of existing houses in the 'older quarter'. Some parts of the village have been restored to the original traditional style and Oroklini village boasts some fine restaurants. The village is located close to sandy beaches which now proudly own the international Blue Flag award and a mountain backdrop which offers spectacular views as far as Famagusta on a clear day. In the immediate vicinity is a lake popular with bird watchers, woodlands, nature trails, an animal ranch with horse & donkey rides and even go-carting, a chapel dedicated to the prophet Elias and Saint Catherine's Church with its spring of Holy water. The International Airport is 20 km away. Ayia Napa/Protaras area can be reached within 20 mins drive, Nicosia can be reached within thirty minutes, Limassol 45 and the Troodos Mountains in an hour. Although Oroklini is a village, there is certainly no shortage of things to do in the area. There is an internet cafe at the Lithos Tavern in the village, also horse-riding, go-karting, donkey rides, ten-pin bowling, bars & a playground for the kids. For those who enjoy walking, Oroklini Hill is a few minutes walk away. From the top there are stunning views and on a clear day it is possible to see as far as Stavrovouni Monastery, the Salt Lakes at Larnaca and the Troodos Mountains. If you don't want to walk up the hill you can hire a 4x4, a mountain bike or quad bikes to drive up and around it. The coastline, with its golden, sandy beaches, is home to a number of four star hotels and a wide selection of international restaurants. Here there is bowling and a variety of water sports, including scuba diving with one of the best shipwrecks just off Larnaca bay. Cycling is also popular and there are excellent walks. Close by, Dhekelia has horse riding and a small golf club. There are go karts near Larnaca and an excellent water park at Ayia Napa (25 Km away). Further afield, the Troodos mountains are good for winter skiing. Oroklini's Yanathes beach is 3km from the centre of the village. It stretches along Larnaca Bay for 2km and is suitable for families and couples alike. This pleasant sandy beach has been awarded a coveted blue flag. It is protected by lifeguards and artificial reefs and offers calm, clean water. You can fish, swim, snorkel, scuba dive and play beach volleyball here. There is a car park, a promenade, showers, toilets, a beach snack bar and restaurant. The beach has parasols and chairs available for hire in season. If you like to scuba dive there are several good diving centres in the area and you are not far from one of the top ten diving sites in the world, the Zenobia. You can also take boat trips from the marina at Larnaca. The Oroklini festival, a well established annual event, takes place on the first Friday and Saturday evening of September on the Oroklini seafront. It includes theatrical performances, concerts, Cypriot folk dancing, music and barbeques. The festival reflects historic and cultural traditions, promoting friendship amongst locals and visitors alike. Not to be missed! Two of the restaurants in the village centre, Voreas and Mandra Tavern have recently received awards from the Cyprus tourism organisation for the quality of their traditional Cypriot cuisine. In the evening at the weekends the Mandra Tavern sometimes hold barbecues and play live folk music in their outside dining veranda which offers lovely views of the area and the sea in the distance. In addition, there is a pizza shop in the village that does superb take-away pizzas and a fish and chip shop near the fire station. If you'd like to eat a light lunch the Achilles tavern, which has blue gingham table-cloths on the tables outside, offers a good hot meat baguette. Alternatively there is Andreas & Helen Cafe where the men of the village play backgammon and cards and you can watch British Premier League Football on a Saturday night. If you enjoy more lively evenings there are plenty of bars on the tourist strip by the beach. Opposite the Princess Beach hotel (3km) on Oroklini beach is the Agrino, a pub popular with the British. They have a karaoke evening that attracts people from a wide area. Near here, opposite the Palm Beach Hotel, there is a good but inexpensive restaurant that we like called Alexis. The food, which is mainly local dishes, is good and the drinks are reasonable. Many traditional tavernas in the surrounding villages offer excellent value. Come and visit Oroklini for an authentic, no trims, Cypriot experience. Book to stay for more than 20 days and get up to 8% off. Click on the villa picture for more info.